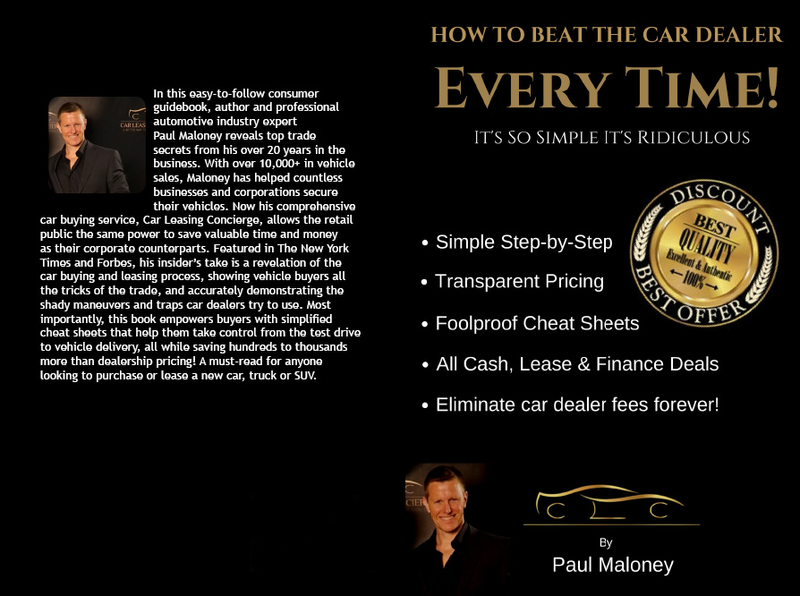 2018 #1 Best New Car Buyers Book! I know there’s a lot of books out there about buying cars, but no one has taken the time to really understand what you, the customer, go through. There’s nothing worse than going from dealer to dealer and having to participate in all the back and forth game playing when all you really want to do is simply buy a new car at a fair price and be on your merry way. What if you could change the playing cards to work in your favor? What if there was a way that you could go into a dealership and test drive the vehicle you want to buy or lease and extract all the necessary pricing information without the added stress and bullying from the salesperson? With this guide, we’ll empower you to take control of the steering wheel right from the test drive, to parking the salesperson at his desk and get all the necessary information you’ll need to accelerate the process! I'm also providing you with simple step-by-step downloadable foolproof “What to say” Script and Cheat Sheets for all types of scenarios you can take with you. This way, you can be 100% in control and ready for any salesperson and his fast-talking “Let me check with my sales manager” bait n’ switch act. But first and foremost, just so we’re clear, I’m not here to sell you a vehicle, I’m simply here to help you buy or lease one. Now you’re probably asking yourself, “What’s the catch? Why is this guy giving us all this information?” Right? Well, before I give you the information on how to get your best deal possible so you don’t end up on the corner of Sucker Street and Buyer’s Remorse Blvd., let me explain why I’m doing this. The reason I started this concierge service wasn’t by accident. As a former Automotive Fleet Sales Director for the last 20 years, I ended up building a strong and trusting relationship with my clients. As in any good business, it’s most important to listen to your customers’ requests and fulfill their needs with the most transparent and cost-effective strategy done in a timely manner. If you can genuinely help people and treat them how you would like to be treated, it’s a no-brainer you’ll not only end up having a satisfied customer, you’ll also have a loyal client who will refer customers your way. So when businesses started to cut back on their employee perks of corporate business vehicles, many of my customers had to buy their own cars. Since we technically didn’t deal with the retail public, my clients had to go to dealerships just like everyone else to hash it out for themselves! Well, not too long after this happened, I started receiving emails and phone calls asking me if they could purchase their vehicles directly through me at fleet (a.k.a. wholesale) pricing because they didn’t want to go through the lengthy process and deal with the B.S. of sales departments! They knew how cost-effective our quick and easy process worked, with us delivering their new corporate/business vehicles directly to their home or office so it didn’t interfere with their busy schedules. So instead of losing clients and referrals, I’d done business with for the last 20 years, I decided to step outside of the dealership and create a concierge service for my clients so they didn’t have to go car dealerships. I kept my manufacturers’ fleet/wholesale pricing and programs intact, and in return, they would still retain the customer when it came time for their vehicle warranty and scheduled service work. It was a win-win for everyone! After a short time, my clients told their friends and family that they could also use my service instead of going through the car dealership scenario. So that brings me here today. In all my years as an Automotive Fleet Sales Director, I’ve seen just how frustrating it can be for customers to buy or lease a new car. I’m just like anyone else when it comes to buying something. We all picture ourselves with that new TV, jewelry, shoes, clothes, house, or whatever makes us feel good! After all, why shouldn’t we have what we want, since we work so hard to save for it, right? Like I said at the beginning, my goal is to put you in the driver’s seat and give you all the necessary tools you’ll need to secure the best deal possible without a car salesperson trying to take your wallet for a test drive! So now that you understand the how and why this all came about, let me now show you the simple steps to follow so you'll rest easy, knowing you've secured the best deal possible for your hard-earned dollars. In most cases, our clients end up saving anywhere from hundreds to thousands of dollars or more, depending on the vehicle they’re looking to buy or lease. If you stay on this road, you’ll be safe from the detours and dead-end streets car dealerships try and steer you down. I know that after applying this simple method, you’ll never look at buying or leasing any new vehicle the same way again-- guaranteed! Remember, the last place you want to end up on is the corner of Sucker Street and Buyer’s Remorse Blvd.